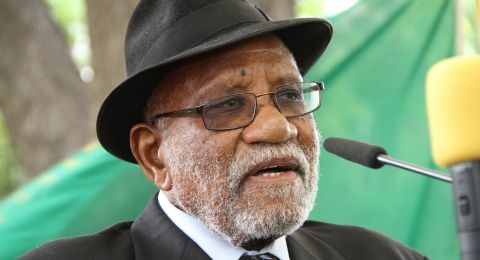 Andimba Herman Toivo Ya Toivo was born on 22 August 1924 in Omangundu near Ondangwa in the Oshikoto Region in northern Namibia. He attended the Ongwediva Industrial School and qualified as a teacher at St. Mary’s Mission School at Odibo. He was part of the Native Military Corps for the South African Defence Force in the Second World War between 1942 and 1943. He taught at St. Mary’s Mission School in northern Namibia until 1951. He then left for Cape Town in 1951 and was employed as a railway police officer. In Cape Town, Toivo organised with political movements such as the Modern Youth Society (MYS) which was constituted by university students and trade unionists. He became the Deputy Chairman of the MYS, which organised festivals, lectures, discussion groups and night schools for activists who pursued further education. Toivo Ya Toivo, Emil Appolus, Fanuel Kozonguizi, Andreas Shipanga, Maxton Joseph Mutonguleme, Jacob Kuhangua, Solomon Mifima, Otillie Schimming Abrahams, Kenneth Abrahams, several hundred Namibian students and migrant workers founded the Ovamboland People’s Congress (OPC) on 2 August 1957 at a barbershop owned by Namibian, Timothy Nangolo at 35 Somerset Road, Green Point in Cape Town. The Ovamboland People’s Congress (OPC) sought to fight for the rights of migrant workers, some of whom had deserted the exploitative South West African Native Labour Association (SWANLA). The organisation also mobilised against the incorporation of Namibia into South Africa, and therefore shared a political allegiance with other organisations in South Africa such as the African National Congress (ANC), the South African Congress of Democrats (COD) and the South African Communist Party (SACP). Toivo Ya Toivo was deported to Namibia for sending a tape to Mburumba Kerina and Rev. Michael Scott who were petitioning against the occupation of Namibia by South Africa at the United Nations Organisation (UNO) Headquarters in New York. The tape described the extensive human rights violations during the occupation of the country by South Africa. The Ovamboland People’s Congress (OPC) was the forerunner to the Ovamboland People’s Organisation (OPO) and the South West African People’s Organisation (SWAPO), which were formed in Namibia between 1959-60 by activists Sam Shafishuna Nujoma, Louis Nelengani and Andreas Shipanga, amongst others. Toivo was put under house arrest on his return to Namibia and Chief Johannes Kambonde was charged to supervise him at Okaloko in northern Namibia. In a trial in August 1967 between, 'The state v. Tuhadeleni and 36 Others', Toivo Ya Toivo appeared as Accused No. 21. Eliaser Tuhadeleni and Nathaniel Maxuilili amongst other members of the Peoples Liberation Army of Namibia (PLAN), the armed military wing of SWAPO, were tried in the first trial under South Africa’s Terrorism Act of 21 June 1967. The Terrorism Act was applied retrospectively to convict these political activists from Namibia. Toivo Ya Toivo made a speech at the trial which was widely publicised thereafter. He stated in brief that, 'We are Namibians, and not South Africans. We do not now, and will not in the future, recognise your right to govern us; to make laws for us, in which we had no say; to treat our country as if it was your property and us as if you are our masters. We have always regarded South Africa as an intruder in our country. This is how we have always felt and this is how we feel now and it is on this basis that we have faced this trial'. On 9 February 1968 Toivo Ya Toivo was sentenced to 20 years imprisonment and sent to serve his sentence in the notorious prison of Robben Island near Cape Town. Toivo was placed in solitary confinement for a year and then jailed in the single cell in Section B with other prominent ANC leaders such as Nelson Mandela, Walter Sisulu and others. Other Namibian political prisoners were kept in Section D. He was released from Robben Island after serving 16 years in March 1984. When he was released he returned to Namibia for a short period and was appointed Secretary-General of the SWAPO party from 1984 to 1991. He went into exile and continued to play a pivotal role in the liberation struggle in the region and on an international level. After the independence of Namibia on 21 March 1990, he was appointed to the National Assembly and then as the Minister of Mines and Energy. Toivo was then appointed as Minister of Labour, and finally as Minister of Prisons and Correctional Services until his retirement from office in 2006. Toivo Ya Toivo passed away on 9 June 2017 in Windhoek. He was 92 years old. • Lauren Dobell, Swapo's struggle for Namibia, 1960-1991: War by Other Means, Carl Schlettwein Publishing. Basle, Switzerland, 2000. • Victor L. Tonchi, William Lindeke and John J. Grotpeter, Historical Dictionary of Namibia, Scarecrow Press, Plymouth, United Kingdom, 2012, p. 333.